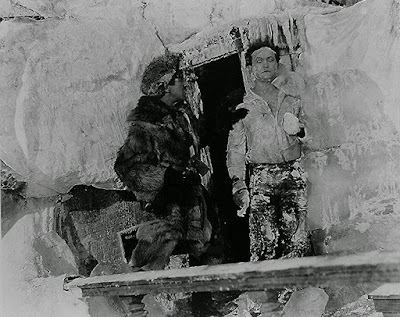 I'm going to explore Houdini's interest in ice. What, you might be thinking? Yes, Ice. It's not something I really thought of until recently. There are several instances in his career where ice was a factor. For example, who can forget the scene from the Tony Curtis Houdini movie where he is in the bathtub filled with ice cubes. So iconic was this scene that a similar scene was added to the Houdini movie starring Adrian Brody. And this very activity confirmed to have actually happened by biographer, Kenneth Silverman. Another ice scene comes from the Curtis movie as well, with Houdini trapped under the ice in Detroit. And again, a similar scene in the Brody movie version. These are based on stories that Houdini himself told about having to cut a hole in the ice for a particular escape. Historians are unclear as to whether this truly took place, though the consensus is they did not. In the book, Houdini's Escapes and Magic by Walter Gibson, there is a a curious escape listed as "Escape From A Block of Ice" It reminds me of the Milk Can with a block of ice around it. It reads as a very interesting escape idea. But after reading the method, which is diabolical, I also think it wouldn't work. The weight of the ice is going to cause some issues that I'm not sure can be overcome with the method suggested. Still, if it were actually made, I'm sure they'd soon find this out and come up with an alternative method of escape, equally as diabolical. 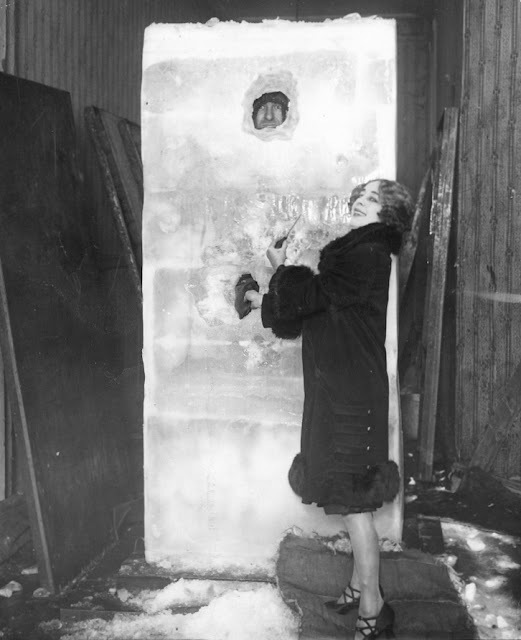 Next we come to an interesting idea that Houdini had, being frozen in a block of ice, or having an assistant instantly frozen in a block of ice. It's something he was never able to accomplish during his lifetime. But only a year after his death, his wife Bess had the whole thing put together. It's actually Bess's presentation that I want to focus on. I found a description of the effect as witnessed by Guy Jarrett, the brilliant illusion designer. Jarrett had a way of thinking about illusions that was really beyond what almost everyone else was doing. Just look at what Houdini created to make an elephant vanish vs. what Jarrett created. There is a lot of speculation about Houdini's exact routine, but it's a pretty universal opinion that it wasn't his strongest effect. But what about Jarrett's illusion? If only you could see Jarrett's Elephant Vanish? Well, his version was used by Siegfried and Roy and proved to be an amazing spectacle and you can. But let's get back to Freezing a Man in Ice. This description comes directly from The Jarrett Book. The dimensions of the tank were 4ft square by 7ft tall. They sides of the tank were made of wood. A hose went into the tank to fill it with water. Then a man in a rubber suit was lowered into the tank. Finally a lid was put on the tank and it on top of the lid was mounted some sort of ice machine. This was supposed to cause all the water to freeze into ice in a short period of time. After a bit, the lid and sides were removed leaving a person who could be seen frozen within the block of ice. According to Jarrett, at this point the illusion "was great, it was grand, it was damn good!" Now, I'm stopping there to let this image sink in. Guy Jarrett was the person who made fun of most other magicians and their illusions because in his opinion they didn't fool the audience. And here he really liked this first part of the Frozen In Ice Illusion. Unfortunately that was not the end of the trick. The conclusion of the illusion really ruined it for Jarrett and for the audience apparently too. But reading the description above, it sounded like Bess Houdini, and if he had lived, Harry Houdini, would have had one truly mind boggling new illusion on his hands. The illusion by the way was built by Rudy Schlosser, a NY magic dealer. According to The Complete Jarrett by Jim Steinmeyer, "he specialized in feather flower effects, and produced a number of pieces of apparatus for Houdini's Final Tour. The Frozen In Ice Illusions appears to have been presented only a few times. First time for the United Booking Office, who declined to pick it up for Vaudeville. Second time was for Loew's theater in NYC, which is the location where Jarrett watched the mystery. Then after the first of the year, at the Longbranch Theatre in New Jersey. John Cox also covered this Frozen In Ice Illusion way back in 2011. For a more complete overview of the trick, please check out what he had written.